Chennaiites have been reeling under oppressive heat … there is no respite from the humid conditions. In Feb 2014, Chennaiites woke up to an unusual chill with the minimum temperature dropping to 20 degree Celsius in the city and 18.7 degree Celsius in Meenambakkam. That was a cold day ……… The hottest day of 2013 was May 23, with a high temperature of 106°F. The hottest month of 2013 was May with an average daily high temperature of 99°F. The longest warm spell was from August 19 to August 30, constituting 12 consecutive days with warmer than average high temperatures. The coldest day of 2013 was December 16, with a low temperature of 66°F (18.88 degree Celsius). ‘blow hot and cold’ figuratively would mean ‘to be changeable or uncertain (about something)’ ; Violenza al sole (also known as Blow Hot, Blow Cold and The Island) is a 1969 Italian thriller-drama film directed by Florestano Vancini. Siberia is an extensive geographical region, consisting of almost all of North Asia. Siberia has been historically part of Russia since the seventeenth century. The territory of Siberia extends eastwards from the Ural Mountains to the watershed between the Pacific and Arctic drainage basins. ~ not applicable for Chennaiites that too now but still if you thought your shower was chilly this morning... think again! Siberian Times mentions of a brave swimmer peeling off for a dip in an icy river Kuydusun in Oymyakon, the coldest inhabited settlement in the world. The air temperature as he swam had dipped to minus 60C. Yet this was no ordinary swimmer. Taking the plunge was the Keeper of the Cold in this part of Siberia, called Chiskhaan, we are reliably informed. Going by that bizarre interesting report, 'Tourists from Europe came to visit the residence of the Keeper of Cold in Yakutia, who lives in Oymyakon, and were offered the chance to have a look at a part of a local river that never freezes over,' a person is quoted as saying to Siberian Times ... We agreed to come back in the morning and watch him bathe. The tourists were ready with cameras around 11 am… then came Chiskhaan...' the brave swimmer for a dip in an icy pool in Oymyakon, the coldest inhabited settlement in the world. While some areas of Siberia are this winter unusually mild, the thermometers in Yakutia - officially called the Sakha Republic - have reached the deep cold for which this region is world famous. Oymyakon is on the Indikirka River, but it is said to take its name from the Oymyakon River, the origins of which mean in the local language 'unfrozen patch of water, place where fish spend the winter'. It was here on 6 February 1933 that a temperature of minus 67.7C was recorded at the local weather station, the lowest ever for any permanently inhabited location on Earth. 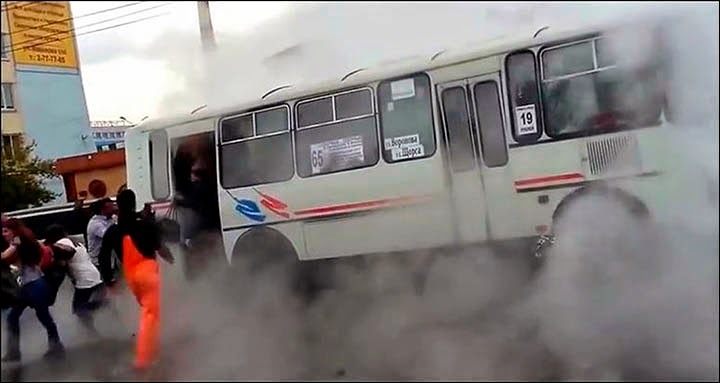 ~ while this report is a few months old, the latest one is about packed minibus being filled with boiling water after 'geyser' bursts through Siberian street…. It is stated that 13 people suffered serious burns in freak accident caused by a sudden burst in hot water pipeline. The report adds that there were scenes of panic as people pawed at the windows desperate to escape the bus. The boiling water shot out a manhole rising like a fountain to a height of a five storey building. The bus driver tried to go through the obstacle but the road had caved in, and the vehicle drove into the steam-covered crevice, becoming stuck, and turning into an oven on wheels. The driver jumped through the smashed windscreen to flee but did not open the doors for more than fifteen passengers including five teenagers. The bus got rapidly filled with scorching water in Vavilova Street in Krasnoyarsk. Thirteen people were reportedly rushed to hospital with heavy skin burns, some in life-threatening condition,' said regional clinic official Irina Kochetkova. Passenger Svetlana Bochaldina, plucked to safety from the bus, told how she expected to be boiled to death. 'From the ground was the fountain of hot water, everything was covered with steam,' she said. 'It was visible from a long way away. But for some reason the driver drove directly in this steam. Suddenly, this flow of hot water poured into the bus. 'All this hot water poured over us, people ran to the back door, but it was locked, we couldn't open it. The passenger complained of difficulty in breathing; the water was so hot as she fell straight into the boiling water. Other people were falling into it, too. The report adds that the driver could face up to two years jail for traffic regulation violations. ~ even as people were struggling there wre some standing around with phones and filming everything on their cameras. The press service of LLC 'Siberian Generating Company' blamed the accident on wear and tear of the pipe, built in 1976. We often have read about ‘bursting and overflowing’ of pipes in a Standard Fire Policy ~ but this one was never imagined.